Beside asking them to remain, He also asked them to keep watch. The root word for keep watch is very familiar: For this reason it says, “Awake, sleeper, and arise from the dead, and Christ will shine on you.” ( Ephesians 5:14) Jesus asked them to stay awake, but they could not. The root word for watch is very powerful. It can be used with raising the dead; stir up and rise to arms; get up, come, and rouse. Apparently watching wasn’t just watching. Perhaps we have a contemporary analogy. Think of the word worship. It’s both a verb and noun. It is both action and attitude. But oftentimes we fall too easily into the spectator mode. We watch the worship, rather than being engaged in it. Besides, who is it we are watching? Shouldn’t we be fixing our eyes on The Most High? And on Jesus, the Author and Perfecter of our faith? True worship should stir us; it should cause us to rise up. Who knows, we might even be risen from the so-many dead who occupy the pews on a Sunday morning. Figure out what pleases Christ, then do it. In this verse, we again witness the amazing condescending love of Jesus Christ: Keep watch with Me. What an awesome privilege we have to keep watch with the Son of God. Like Peter, James, John; will you stay and watch with Him? I suppose one could ask: Watch what? The disciples probably didn’t even have a clue. Do we just watch Him? Do we watch for the betrayer? Well, maybe they had a clue, and so do we. We watch Jesus; and at this point we note that He was grieved and distressed. Grieved is most often translated as some form of sorrow. There are many reasons for His sorrow: He was leaving His friends, His disciples. 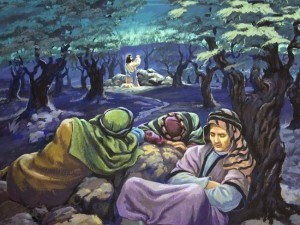 He is grieved because of what will happen to His disciples. He is experiencing first hand what it means to be ensnared by sin. Although He was a Son, He learned obedience from the things which He suffered. (Hebrews 5:8) I’m sure the sorrow also had to do with the complete disregard and ungratefulness mankind for the great salvation He was providing for us. Yet as we learned in Isaiah 53, He still became our sacrifice. Distressed is also translated as heavy. Surely the sins of the world were beginning to weigh Him down. The above passage from Hebrews applies here as well. These were probably new emotions the disciples were witnessing in Jesus. In fact Christ being grieved during the Last Supper, just a few hours before, was only the second occurrence of grief. There it had to do with being betrayed. But here in the Garden, we find Jesus providing insight into His condition to His followers Peter, James, and John. How grieved was He? He was deeply grieved, to the point of death. This may have been new to His followers, but it was foretold: A man of sorrows and acquainted with grief. I wonder if this occurred to His disciples? Did they realize it was their sins which brought about His grief? Only once was the Savior grieved outside of the passion. It was earlier in His ministry. It’s worth noting that here is the origin of the Jews trying to kill Him. It had to do with the supposed breaking of the Sabbath. And the hardness of the Pharisee’s hearts, which caused them not to rejoice in the healing of someone in their midst, eventually culminated in the crucifixion. Let this be a warning to us all. Left unchecked, the hardening of one’s heart will lead to devastation and great loss. Only three times then, is it recorded of Christ being grieved: the first regarding the hardness of hearts; the second during the last supper; the final in the Garden of Gethsemane. Grief in His last days was brought on by betrayal and His impending death, as the sin of the world gathered around Him. Having a hard heart is serious; and we should consider well, its menace. Are you able to grieve because of what you caused the Christ, the Son of God to suffer? Or is your heart hard, unable and unwilling to see what Jesus Christ has done for you, what He went through for you? This entry was posted in All Entries, Lent and tagged Awake, Do It, Grief, Raise, Sabbath, Sorrow, Spectator, Watch on April 8, 2019 by Steven Davis.